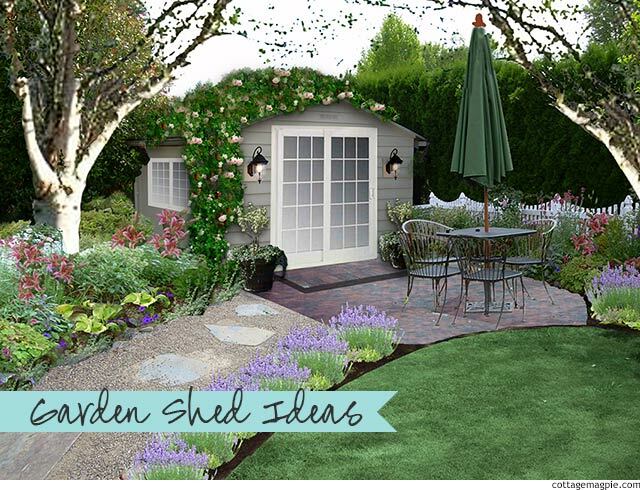 Dear Angela: Can My Garden Shed Be Cottage-y? 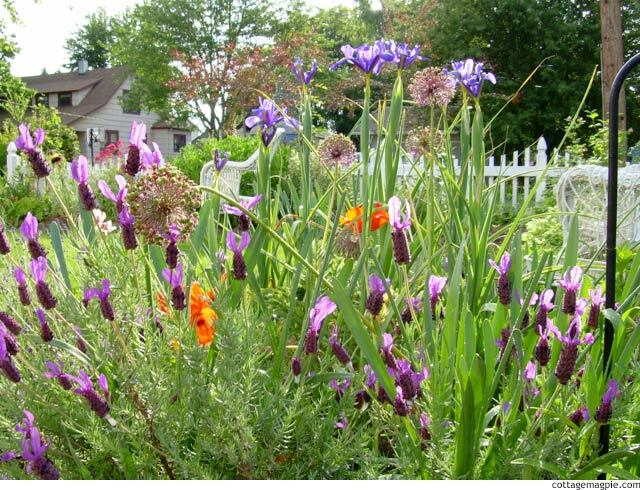 I moved to a new home this summer, and I have set aside a back corner of the garden for a romantic cottage-style garden, but I am having trouble envisioning what I might do or how it might look. Especially with that ugly shed in the middle of it all. I also have to put in a fence along the green hedge to keep the neighbors dog out. The dog is very polite and well-behaved, but he has a habit of using my lawn for his morning constitutional. A low fence should suffice, but I can't picture how to put a fence with the arborvitae hedge there. I spent some time with your photo, and as you can see I got a little (a lot) carried away. But even though this plan is somewhere in the realm of fantasy, I still think that it will help spark some ideas to get you going in the practical realm. 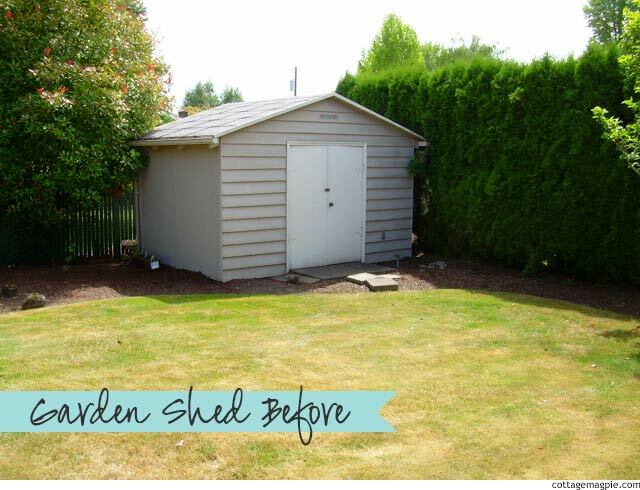 I started with the shed, giving it a virtual fresh coat of paint, French doors and coach lamps, Next, I found myself wanting to add trees. And plantings. And a patio. And a pathway. I also included a picket fence to solve your dog problem. Since you don't need a tall fence, this should work fine, and I like how the white pickets stand out against the dark green arborvitae. 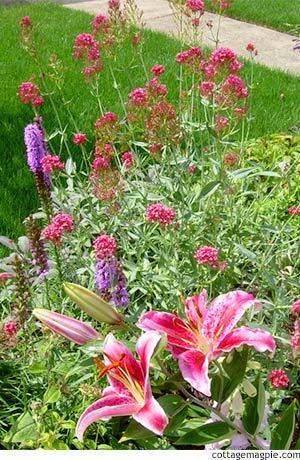 They also provide some additional structure for the blowsy cottage style perennials that I know you are looking for. I hope this helps give you some ideas! 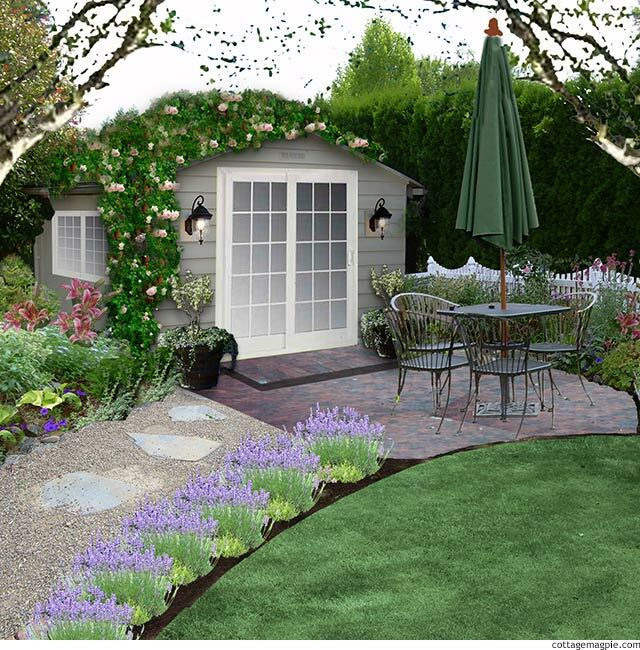 And whatever else you decide to complete, I hope you include some lavender to line the path and clematis and roses to clamber over your shed. Beautiful and fragrant, they are a must have.